So you're ready to get dressed and you grab your favorite jeans which you remember that you just washed as you struggle to get them up and buttoned. Relax... it may be the extra cookies you ate, but more likely, your favorite denim contracted in the heat of the dryer and this is fixable. My sister calls it "Jeans Aerobics" and anyone can do it to get their pants up and themselves, out the door. When you are putting your tight denim on, pull it to where it catches whether that is a button that won't button, or just getting them up. Relax, your jeans probably just shrunk a bit in the dryer as the denim is likely to constrict making them feel more snug than is comfortable. 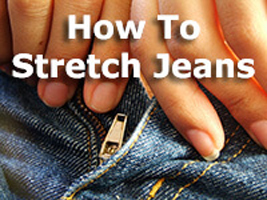 Take a deep breath - this likely is fixable and you can stretch the jeans back out to pre-dryer shape. One secret I learned from my Mom is to iron the jeans. This heating and flattening out of the weave of the fabric doesn't stretch out the denim, but rather flattens and spreads it out. 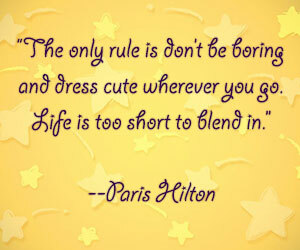 Ironing really makes a big difference, most of the time it's all you need to do. Try the jeans on while they are still warm , but not too hot, it they are still too tight, the warmth will help for the next steps. Do a series of squats lunges and stretches in your denim to get the fabric to "give" a bit and the fabric should feel more relaxed and able to pull on. If this doesn't stretch the jeans out enough, don't despair. If you still can't get them on, the next step is to take them off. Fill a spray bottle with either tap water or tap water with a teaspoon of liquid fabric softener and mist the top half of your jeans to lightly damp. Dampening the fabric will help it give and you can manually stretch the jeans with your hands or put them on and repeat the "jeans aerobics". They should fit! If your jeans run a bit snug, try not to dry them in a dryer and instead hang to dry. If you throw them in a dryer, limit the heat to the delicate setting to reduce the heat that constricts the fabric.